The destination wedding is the new in thing for the couples these days. However, Planning for a destination wedding is a long and tedious process. Be it in Udaipur, Jaipur, Andaman, and Nicobar, Kerala or anywhere you like, these destination weddings turn out to be a glamorous affair for the guests. However, even though, for the hosts it might be a very sought-after thing, the chances of planning it successfully by ones-self is almost impossible. It is better to google plan my destination wedding and find out the best destination wedding planner. If you are searching for the best destination wedding in Hyderabad, Rachnaoutsav is your answer. Rachnaoutsav destination wedding planner professionals are pros in organizing such a destination wedding within short spans of time. The destination wedding is our forte. We are the top destination wedding planner in Hyderabad. We are capable of arranging luxurious destination weddings in a comparatively short span of time. The arrangements for a destination wedding are quite huge. The process begins with selecting the destination, booking the location well in advance so that it is available, visiting the destination multiple times before the special day to be able to decide on the other arrangements, like decorations, seating, stage and the like appropriately, making the arrangements well in advance for the special day, being prepared before the day begins and ends with accommodating the guests and hosting the party and attending guests. Rachnaoutsav professionals are skilled to handle your big day and make it a grand success. Their dedication to working made Rachnaoutsav the top destination wedding planner in Hyderabad. Wish to have a special destination wedding, let us know the dates and the location we’ll ensure we make your wedding a memorable event, not just for you but for your guests You don’t have to lift a finger. You just choose from the destination wedding packages. Hyderabad boasts of the marvelous destination wedding packages we offer that make us one of the top destination wedding planners. Accommodation is the most challenging task for a destination wedding for most wedding planners and thus we ensure that we can accommodate all your guests comfortably at the destination and make the arrangements for the same well in advance taking into account your full guest list. 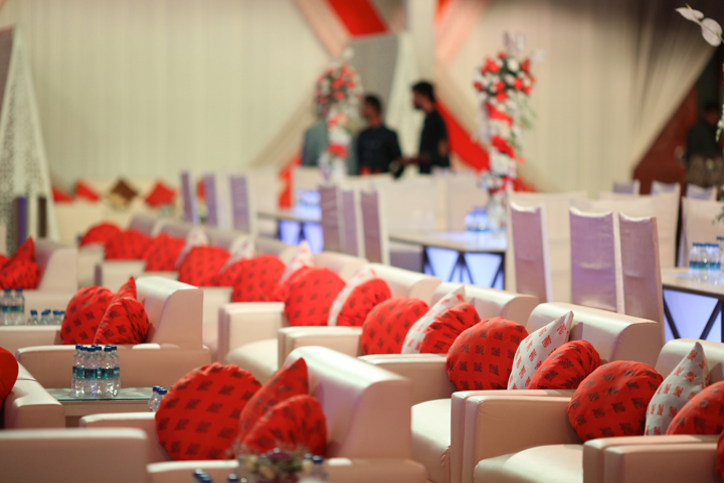 We make your big fat dream wedding come true and ensure that there is not a thing that you need to worry about. Whichever destination you choose we have appropriate arrangements for the same and make sure the decorations along with other arrangements go well with your personality, the location and the need of the day. No matter which destination you choose, how big your guest list is or what all specifications you want us to incorporate we are ready to take up the challenge and make the destination wedding a day to remember for one and all. These are the reasons we are one of the top destination wedding planners in Hyderabad.